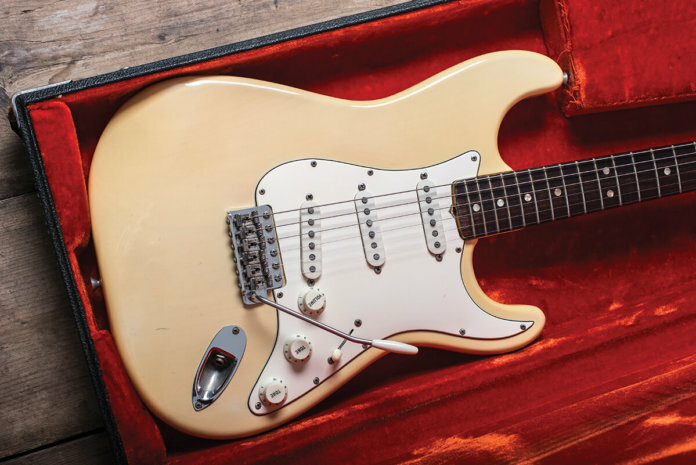 The following techniques we are going to discuss all fall into an overarching concept called Legato. Legato is an Italian term which translates to “tied together”. 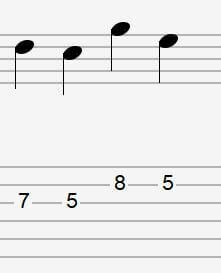 This means we will be playing multiple notes with one pick stroke and making sure they tie together with our left hand. The Hammer on is a very common technique in guitar. You won’t have to look far to find examples of big players using this technique. To perform a hammer on, you place your finger on a note and play the note, then using your fretting hand “hammer” onto another note. You will need to push the second note hard enough to make it sound out. If the second note chokes, or is quieter than the first, you aren’t hammering on hard enough. A pull off is the opposite to a hammer on. Instead of hammering onto a higher note, we are now pulling off to a lower note. The principle behind this remains the same, we are using two fingers, except this time both fingers need to be in place before you pick the note. You are picking the higher note and pulling that finger off to allow the note fretted by the lower finger to take over. When pulling off, you should give the string a slight downward flick with your higher finger to allow the second note to sound a little louder. A slide is when you play a note and slide to another note with the same finger without lifting pressure off the string. You should aim to get from one note to the other without “dragging” any frets in between. If you drag your finger too hard you will hear each note in between the start note and target note. There is a fine line between pressing too hard and dragging your finger along the notes and taking the pressure off and killing the note before you hit your target. You can slide up from one note to a higher note or start at a higher note and slide down to a lower note. 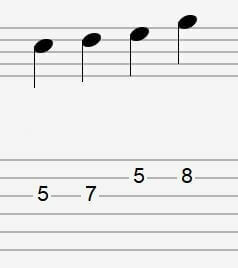 This exercise uses both hammer ons and pull offs and the notes are taken from the A Minor Pentatonic scale. The first three bars are ascending through the scale using hammer ons. You will be picking the 5th fret on each string and hammering onto the 7th or 8th fret as you go. The final three bars are descending back through the scale using pull offs. This time you’ll be picking the higher note of each string and pulling off to the lower. Remember to have both fingers in place before pulling off. This exercise uses hammer ons and notes from the A Minor Pentatonic scale but in a less scalic way. This will give you a more natural feel and sound to what you’re playing. More likeness will be found with how you’d use these in the real world. Similar to Exercise 2, this exercise follows the same format but now we are using pull offs in place of hammer ons. This example follows the exact same note groupings as Exercise 1, except instead of hammer ons and pull offs, we are now sliding up and down to and from each note. The first three bars are ascending slides, you will be picking the first note and sliding to the second. The final three bars are descending so the highest note will be picked and slid down to the lowest. As with Exercise 2, this is all ascending slides in the place of hammer ons. This will allow you to get a feel for slides across different strings rather than following a scale pattern. All the slides in this exercise are ascending slides from a low note to a high note. This exercise is the same concept at the previous, except this time the slides are descending from a high note to a low note. 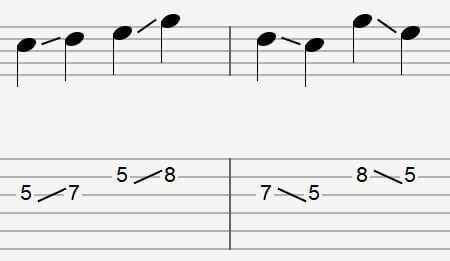 A good place to start to integrate these techniques is to revisit the patterns you learnt in Lesson 6 as you will find many instances where you can replace two picked notes with hammer ons, pull offs and slides.